If you don’t want details read the first and last paragraph. In 1975, Isaac Ehrlich published an empirical study purporting to show that the death penalty saved lives, since each execution deterred eight murders. The next year, Solicitor General Robert Bork cited this study to the Supreme Court, which upheld the new versions of the death penalty that several states had written following the Court’s 1973 decision nullifying all existing death penalty statutes. Ehrlich’s results, it turned out, depended entirely on a seven-year period in the 1960s. More recently, a number of studies have attempted to show that the death penalty deters murder, leading such notables as Cass Sunstein and Richard Posner to argue for the maintenance of the death penalty. In 2006, John Donohue and Justin Wolfers wrote a paper essentially demolishing the empirical studies that claimed to justify the death penalty on deterrence grounds. Donohue and Wolfers attempted to replicate the results of those studies and found that they were all fatally infected by some combination of incorrect controls, poorly specified variables, fragile specifications (i.e., if you change the model in minor ways that should make little difference, the results disappear), and dubious instrumental variables. In the end, they found little evidence either that the death penalty reduces or increases murders. Now the macroeconomic world has its version of the death penalty debate, in the famous paper by Carmen Reinhart and Ken Rogoff, “Growth in a Time of Debt.” Thomas Herndon, Michael Ash, and Robert Pollin released a paper earlier this week in which they tried to replicate Reinhart and Rogoff. 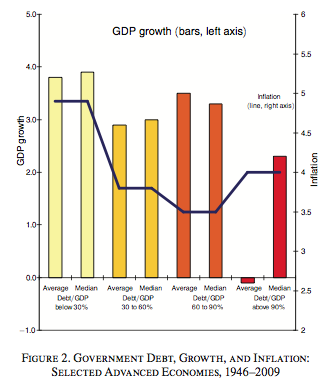 They found two spreadsheet errors, a questionable choice about excluding data, and a dubious weighting methodology, which together undermine Reinhart and Rogoff’s most widely-cited claim: that national debt levels above 90 percent of GDP tend to reduce economic growth. The results were averaged by country and then the country averages were themselves averaged. The problem here is that, for example, New Zealand only had debt above 90 percent in one year, and in that year its growth was –7.6 percent—but since only ten countries ever had debt over 90 percent, that outlier constituted one-tenth of the average. Their spreadsheet formula accidentally omitted several countries; including those countries increases the average growth level for debt levels over 90 percent. One figure—New Zealand’s—was mistranscribed from one spreadsheet to another; correcting that mistake slightly raises the average growth level. I think the most natural reading of this passage is that they were averaging individual country-year observations, not countries. The other surprising thing, of course, is that they were using Excel (or some other spreadsheet program)—something that I wrote about recently. The attraction of Excel is that it’s visually intuitive, it’s powerful, and it’s fast. The problem is that it’s very easy to make mistakes, it doesn’t have any usable kind of versioning, and there’s no good way to proofread or test it. As Herndon et al. write with considerable understatement, “For econometricians a lesson from the problems in RR is the advantages of reproducible code relative to working spreadsheets.” And if you’re going to use Excel for anything important (like counseling economic policymakers), you’d better be damn good at it. For example, you shouldn’t be manually copying numbers from one tab to another (an error shared by Reinhart and Rogoff with the risk management department of JPMorgan’s Chief Investment Office). This raises another issue. Programming is getting easier and easier, but it’s hard to do well. Economics these days depends heavily on programming. It seems to problematic to me that we rely on economists to also be programmers; surely there are people who are good economists but mediocre programmers (especially since the best programmers don’t become economists). If you crawl through a random sample of econometric papers and try to reproduce their results, I’m sure you will find bucketloads of errors, whether the analysis was done in R, Stata, SAS, or Excel. But people only find them when the stakes are high, as with the Reinhart and Rogoff paper, which has been cited all around the globe (not necessarily with their approval) as an argument for austerity.